The apartment (about 48 m²), equipped with parquet and underfloor heating is located in a quiet location on the ground floor of a formerly belonging to the Sporthotel-Bergün building. It is wheelchair accessible. With a patio seat and adjacent, large enclosed lawn find both small and large recreation and relaxation. A playground is not even 50m away. The tracks are right on the doorstep and the skiing and sledging can be reached in 8 minutes on foot. A communal laundry room is available on request. Pets also available on request. There is a possibility, the adjacent apartment B16 to book with them. Ideal for families or friends. The stylishly and comfortably furnished apartments B16 (48 m²) and B17 (66 m²), which we often use, are beautifully situated on the ground floor of a former building belonging to the Sporthotel-Bergün. You have an excellent unobstructed views of the mountains. Only a small path leads past the house. The apartments are furnished to a high standard with parquet flooring and exclusive Gabbeh carpets (B16). The B17 is a high-pile, bright, soft wool rug. They have a separate kitchen, a bathroom, a large living room with 2 beds (normal beds to fold down). The living room has an open fireplace room (fireplace). Apartment B17 has a also a bedroom with double bed. With a patio seat and adjacent, large enclosed lawn find both small and large recreation and relaxation. Of course, the area is also great for football, frisbee, badminton and grill suitable. In winter, the most beautiful works of art and igloos can be built of snow here. A playground is located about 50 meters away. The trail is right on the doorstep and the ski and sledge area can be reached in 8 minutes on foot. Ideal for family / friends holiday, but also as a single and pair. It really is a beautiful apartment and it has a great location. We are self-excited every time when we are here. In summer, bicycles, scooters and bikes can be rented in the village and in winter, of course, sledges and toboggans. Our apartment is equipped with fire extinguisher, fire blanket, and smoke detectors. We have stayed at this property many times fantastic. We loved staying in this little studio apartment. The location was perfect, with a stunning view of the mountains. The apartment was well equipped and perfectly clean. Entering and getting the key was easy, communication was no problem and instructions were perfectly clear. Bergun is a great village! We'll come back! 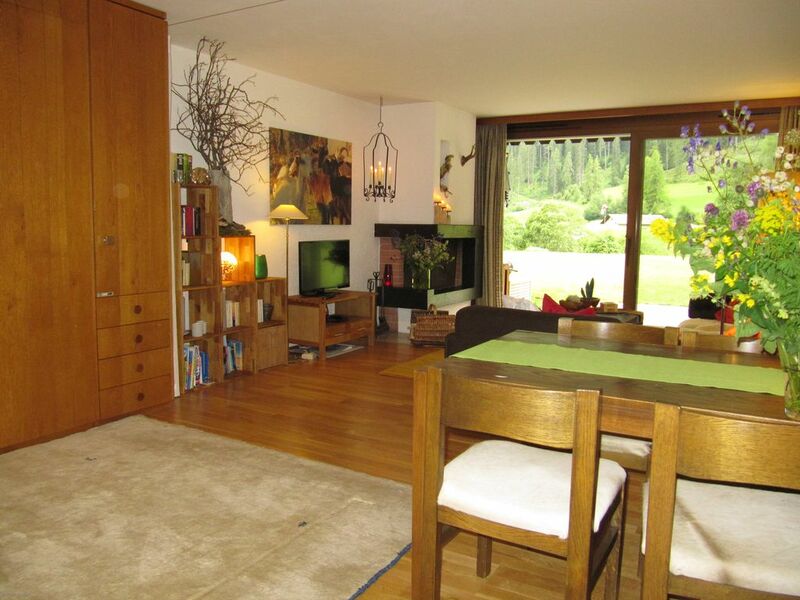 Eine Ferienwoche der Superlative wie Appartement, Wetter, Schnee! Zum wiederholten Male durften wir diese hervorragende und traumhaft schöne Unterkunft nutzen. Das Apartment hat eine tolle ruhige Lage. Raus aus der Tür, auf die Langlauf Ski, die Ski, den Schlitten oder einfach nur zu Fuß. Wo findet man sonst so etwas? Wir kommen auf alle Fälle wieder. Die Ferienwohnung ist sehr schön und traumhaft gelegen in dieser einzigartigen Bergwelt. Wir haben unseren Urlaub in die ersten beiden Wochen im September hier verbracht und uns sehr gut erhohlt. Bergün ist ein sehr schönes altes Dorf inmitten dieser wunderbaren Berg Kulisse. Der Naturpark Ela hat jeden Tag zum wandern eingeladen in wir würden sehr gern wieder kommen. Berguen still belongs to one of the most idyllic, pristine Grisons villages. Here and in the neighboring villages Laces and Stulles the Heidi films were shot. In spring, summer and autumn, there is excellent walking opportunities and mountain bike tours in the surrounding valleys. The Railway Historical Preda - Bergün draw young and old alike. In summer, the outdoor swimming pool unique setting. Berguen is also a great starting point for classic mountaineering, for example for Keschhütte Piz Kesh, the Ela hut Piz Ela and other surrounding three thousand. From summer to autumn is the double chair Darlux in operation, leading to just under 2000 meters high mountain restaurant La Diala. Who morning goes early to hike, see the variety of wildlife that you still here fortunately. Ibex, chamois, deer, marmots, eagles, bearded vultures are not uncommon, but always to be found. The flora is also available in such a variety and beauty, as they are hardly otherwise. Whether orchids, lilies, bluebells, crocuses, gentians and edelweiss, around Berguen everything is abundant. In winter, especially the longest Naturschlittelbahn Europe, which leads to a distance of 6 km on the (in winter closed to motor vehicles) Albula Pass road from Preda to Bergün utilized. It is a great experience for all ages. At night, the track is illuminated with floodlights. Another exciting toboggan run (4 km long) leads from Alp Darlux in the 576 m below Berguen. For skiers there is the Darlux ski area with 25 km of piste up to 2,552 m, two chairlifts, a ski lift and numerous ski slopes, which are also available for snowboarders. There are 2 ski lifts in the village at Tect / Zinols for beginners and families.